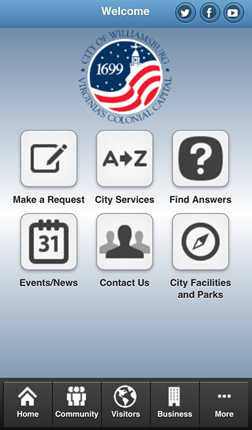 The City of Williamsburg’s new smartphone app – Williamsburg Wayfinder– transforms the way residents and visitors interact with City government, local attractions and businesses. You can submit and track non-emergency service requests, photos, and text messages and now access everything from the Property Information Service (PIS) and Economic Development resources to the restaurants and shops closest to you. "With this new app, we’re providing a single pane of glass into the City," said Information Technology Director Mark Barham. "The Williamsbug Wayfinder replaces CITY 411 and enables users to reach across all departments – from planning and permitting to taxes and facility rental. By capturing, routing and managing service requests, the system will create a convenient form of communication among departments, resulting in faster response times." Williamsburg Wayfinder is also geo-location based, allowing you to customize the experience whenever and wherever it’s convenient. Want to take your morning run someplace new? Use the app to access the Great City Walks and get a map and description of the William & Mary Loop, a 2.1 mile route ringing the campus. Trying to find the closest place for lunch? Use the Shop and Dine map to find out what’s nearby, how to get there, what’s on the menu, and call them directly for a reservation. 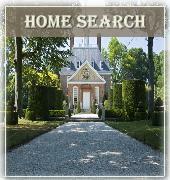 House hunting? If you’re wondering about a house you’ve just driven by, use the app to access the Property Information Service to find out the most recent sale price.